You may already know that Route4Me is the most downloaded mobile multi-stop route planning software on the planet - but did you know that it's already being used to make over 100,000,000 visits per year and tracking over 200,000,000 device location updates per day? We've matured our routing optimization API and platform since 2009 and have eliminated many intersystem inefficiencies so that your business can operate like the world's most sophisticated logistics companies. Many mega corporations invest hundreds of millions on optimizing their logistics and supply chain platforms, but never make their route planning API's or logistics platform available as a SaaS solution with SDK's that you can use. We design our technology and platform exclusively so that it is used by other people, and by visioning our platform in this way we are able to combine planning, dispatch, execution, and post-execution capabilities into a single environment. These capabilities are available to both Route4Me API Users and Retail End-Users through our platform, without having to learn about the complexities of route optimization API's, how to build a massively scalable telematics platform using our HyperCluster™, or a logistics SaaS API's/SDK's. Our unique routing engine is 100% RESTful, and has portable algorithm backends that solve a variety of complex problems in a single HTTP request. Route4Me is the most widely installed and distributed mobile smartphone platform for route planning and optimization in the world. Route4Me is an integrated telematics platform which enables dispatchers and field-service personnel to plan, manage, and execute delivery or pickup routes. By collaborating together and using real-time data from the field, our software enhances any organization and reduces its operating expenses by providing more accurate in-field data about deliveries, service stops, and pickups. The core functionality of the system is its unique route optimizer engine, which substantially reduces the miles and gas usage for a driving route, reduces the manpower needed to fulfill the route, and reduces the amount of time that is needed to plan an optimized route. Route4Me runs entirely in the cloud and has virtually no restrictions often found in legacy systems that have been ported with web-access. Most times, ported systems simply cannot scale in a web environment. We’re an enterprise grade solution that is available at the price/performance value because our platform has been engineered for maximum efficiency using strategies such as elastic scaling. While the system is written and hosted using entirely open source components, our codebase and optimization engine are proprietary. Our Logistics-as-a-Service platform is entirely plug-and-play, and does not require any software to be installed. The system is 100% cloud based, with native high-availability, disaster recovery, and multiple geographically distributed edge points-of-presence for ultra-low latency route optimization. As first company that offers a route planning and route optimization solution on all major mobile platforms, mobility is intrinsic. Our mobile apps interface with our RESTful API’s using a combination of synchronous and asynchronous requests, as well as push messaging, instead of wasteful polling. All system activities trigger pushes to connected devices, and all users are able to see updates in real-time. The unified telematics platform can also consume data from 3rd party GPS units, smart-watches, gauges, IoT and M2M devices, and OBD devices. Low-latency wasn't fast enough for us - so we designed our optimization engine from the ground up in a high-performance compiled language to perform at speeds exceeding those typically found in true real-time environments. The optimization engine, which runs on any flavor of Linux, can optimize thousands of routes per second on a single low-end commodity server. As an example, a 10 stop route is optimized in under 1 millisecond, a 50 stop route in 30 MS, a 200 stop multi-depot route in less than 300 MS, and a 500 stop multi-depot, multi-vehicle, multi-period route in 3 seconds - all on low-end commodity virtualized cloud hardware and in near constant-time. Our distributed asynchronous messaging library, distance matrices, and routing cluster engine are completely in-memory and run in a 100% SSD environment, so that what-if scenarios, simulations, and re-optimizations are even faster than cold-cache hit optimizations. Our logistics, routing, and optimization API's are currently used to plan, execute, and manage in excess of 200 million transactions per year. As you can imagine, we process a large amount of data, considering that each stop has associated data containing notes, multimedia attachments, and a perpetual GPS tracking history of each route and device. The system regularly monitors hundreds of thousands of mobile devices per month and our telematics gateway supports real-time data ingestion from over 500 different telematics vendors. Our geocoding and matrix generating clusters create road-level driving distance and time matrices at the rate of millions of addresses per second. For even more capacity, servers can be introduced into the Active/Active optimization pool, in one or more availability zones, and our optimization systems will scale out horizontally to meet any demand. All web and mobile platforms integrate multiple monitoring, crash tracking systems, application performance management systems, and of course a 24/7/365 support team so that we can maintain a carrier-grade QoS level. For confidential deployments, and those that require the lowest amount of latency, our RESTful optimization engine can function independent of our telematics platform behind a firewall or inside your secure AWS environment. The web and mobile applications leverage our internal API's, support real-time fulltext searching for predictive and historical search, track and trace, dynamic-routing, continuous route re-optimization, time-sensitive time-windows, route re-balancing, just-in-time re-routing, dial-a-ride optimization, dynamic estimated times of arrival, multi-destination navigation, single-driver time-windows, support for Class 1-8 truck routing with height, weight, tunnel, and bridge constraints, and more. Our API supports both JSON and XML formats, in synchronous or asynchronous modes, and we have our own API management, metering, and authentication layer. For larger routes, our engineering lab is developing an accelerated version of our optimizer utilizing the CUDA GPU platform and using FPGA's to achieve a very high routes/core/second compute density using our linearly-scaleable HyperCluster™ techhnology which is able to build cost matrices in near-real time. 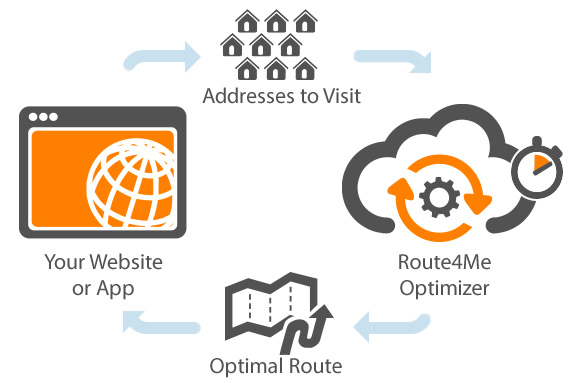 Route4Me API's track every metric about our system and how it is used. All of this data can be exported programmatically with callbacks to S3, Vertica, Redshift, Bigquery, Kinesis, Lambda, and Cloud Functions as destination end-points. The compressed data can be exported for time-series analysis, geospatial network analysis, and historical data analysis. Future releases will permit trickle loading and streaming directly into your data warehouse of choice.